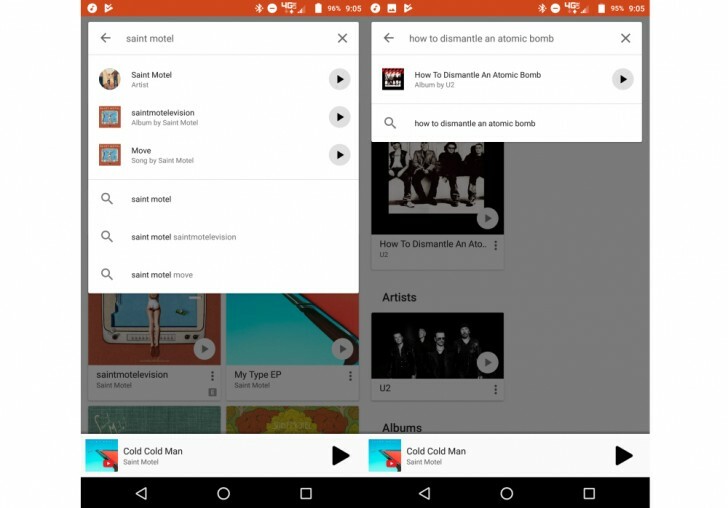 A few months ago, Google Play Music introduced the ability for you to play songs directly in its search interface - but only on the web. This has so far been sorely missing from the service's mobile apps. That's about to change, however. Google is now testing the addition of the same function inside Play Music for Android. The new feature isn't tied to a specific version of the app, as it's been spotted on both 7.9 and 7.10, so it means it arrives via a server-side switch if you're lucky enough. If you receive this, when you search for something in the app you'll see that the auto-suggestions have been pushed lower inside the dropdown. Above those you get the results for the artist, album, or track you searched for. And all of these have artwork on the left and a Play button on the right. If you tap that button, songs and albums will immediately start playing, while for artists you get a shuffle. As you'd expect, if you tap elsewhere inside a search result, you'll be taken to the corresponding listing. The new search dropdown is available everywhere in Play Music, and will surely be a huge time (or tap) saver if you know exactly what you're looking for.